[Episcopal News Service] While reaction to President Donald Trump’s Jan. 24 actions designed to move forward both the Keystone XL and Dakota Access pipelines was swift, the immediate impact of his memoranda remained unclear. Nothing in Trump’s memorandum on the Dakota Access Pipeline appears to force approval of the project but it calls on officals to speed up the U.S. Army Corps of Engineers’ ongoing environmental review process. A presidential memorandum is somewhat different from a presidential executive order and some observers say it has a lesser impact. 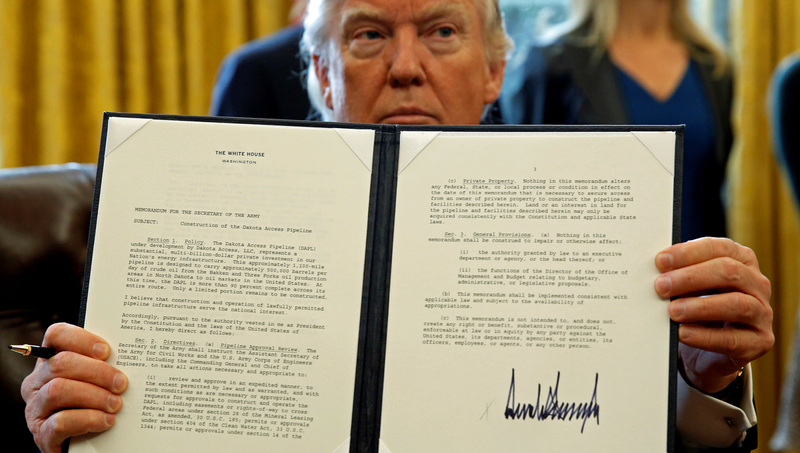 In the Dakota Access Pipeline memo Trump tells the U.S. Army Corps of Engineers to “review and approve in an expedited manner, to the extent permitted by law and as warranted, and with such conditions as are necessary or appropriate” the company’s request to finish the pipeline. The remaining work would push the pipeline under Lake Oahe on the Missouri River just north of the Standing Rock Sioux Nation reservation. The proposed crossing is upstream from the tribe’s reservation boundaries, and the tribe has water, treaty fishing and hunting rights in the lake. The Corps decided Dec. 4 to put that work on hold, cheering opponents, and conduct the environmental impact statement, including exploring alternative routes. The Episcopal Church has been advocating with the Sioux Nation about the pipeline since summer 2016. Local Episcopalians have also provided a ministry of presence in and around Cannon Ball, North Dakota, which has been the focal point for the groups of water protectors that gathered near the proposed crossing. However, Trump’s order says the Army shall “consider, to the extent permitted by law and as warranted, whether to rescind or modify” its Dec. 4 decision, revert to the Corps July 2016 environmental assessment and grant the required easement for the lake crossing. The tribe’s statement noted that on Jan. 18 the Corps opened the public comment phase of its environmental impact analysis of the company’s request. Public comment is due by Feb. 17. Trump told reporters during a White House Oval Office signing ceremony that both pipelines will be subject to conditions being negotiated by U.S. officials – including a requirement that the pipe itself be manufactured in America. “I am very insistent that if we’re going to build pipelines in the United States, the pipes should be made in the United States,” he said, noting that his requirement will take time to fulfill because most steel piping used in the United States is made elsewhere. “From now on we are going to start making pipelines in the United States,” Trump said from the Oval Office. “We will build our own pipelines with our own pipes, that’s what it has to do with, like we used to in the old days,” he said, adding that the directive will put “lots of steelworkers” back to work. Texts of the pipeline-related actions taken by Trump Jan. 24 are here and here. The 1,172-mile, 30-inch diameter pipeline is poised to carry up to 570,000 gallons of oil a day from the Bakken oil field in northwestern North Dakota – through South Dakota and Iowa – to Illinois where it will be shipped to refineries. The pipeline was to pass within one-half mile of the Standing Rock Reservation and Sioux tribal leaders repeatedly expressed concerns over the potential for an oil spill that would damage the reservation’s water supply, and the threat the pipeline posed to sacred sites and treaty rights. The company developing the pipeline, Texas-based Energy Transfer Partners, says it will be safe. Thousands of people, including Native Americans and indigenous people representing about 300 tribes from around the world, traveled to North Dakota in summer and fall of 2016 in an unprecedented show of solidarity with the Standing Rock Sioux Nation. The tribe recently told the people remaining in the protest camps to leave due to safety and environmental concerns over flooding as the massive snowpack in the area melts. The snowpack typically melts swiftly in the area, causing rapid flooding that could sweep people and material into the river. The tribal council was also concerned about continuing protests at the Backwater Bridge leading to and from the area. The tribe had requested an end to those protests but some people in the camps had ignored that request. Previous Episcopal News Service coverage is here. I’ve been an Episcopalian all my life, as well as attending Episcopal schools, and I find the Church’s swing to the left on political matters and opining on secular matters and government policy, very disturbing. A significant numbers of my friends have left the church over this liberal political bias. I expect if the Church doesn’t change its incursion in political life, only Hollywood types and the far left liberal wing of the Progressives will only be the only potential members. Please get back to God’s work and welcome all of all different political persuasions and leave politics outside the Church door. Thank you Stephen. My family’s thoughts exactly. As Gay Jennings+ said in her remarks following the election of Mr. Trump, “resistance is holy work.” Indeed it is. There were folks, like you, hiding behind stained glass windows, to paraphrase Martin Luther King, Jr.’s words, who used similar rhetoric to claim that the church should stay out of the racial politics in the south in the 1960s. But that was (and remains) holy work. Similarly, DAPL has racial and environmental implications, and it’s high time we do God’s work,” and be good stewards of creation, and to stand up for the afflicted. And so, while you claim that many people are leaving the church because the church chooses to act, I will also add that I, as a young convert, wouldn’t be interested in a church that stood idly by. I converted to a church, not a country club. I have been an Episcopalian since the cradle, and the church’s active engagement in social justice is the primary reason why I proudly remain in the fold. In the present political climate in the U.S., the “left” is good and just, and the “right” is evil. If the church were to stand with the “right” side of the political spectrum, I would ditched it long ago. They left the church because they are not Christians, never were, never paid heed to the words of Jesus. Political parities have nothing to do with it. The words of Jesus are what count. No Glenn, people are leaving the church not because we are not Christians it’s because of people like you. We are sick of your name calling and demonizing those of us that don’t see your point of view. There are many of us who have a problem with the depth that the Episcopal Church has emersed itself into politics. When we are gone only you will be left with those like you. Christianity is a religion of acceptance not exclusion. Take a look into yourself before criticizing others. Any time we help others in our community, be it Indians in the S.W., or refugees, etc. it is almost unimaginable the amount of harm this prez will do…almost, except to those who know what depths evil can go to. One might hope that these guys will over reach, but that is problematic….the Beast is very hard to beat. Im sure there were those in Germany, back in the day, that thought ‘surely , it wont get as bad as can be’. Thanks to the majority of american christians, we are about to find out. At last, we have a man who will lead and not take any fake information from these anarchists and rabble rousers. They have gotten all the money they can from the government and now they try a new tactic. Well, there is a new sheriff in town and he and his pardners mean business. Working men & women are despised by the Democrat Party. I belonged but no more. . .I pray it won’t happen in my churxhh . Smart move. Welcome to prosperity and a real life. Nonsense, Donald! I am a Democrat precisely because the Party is pro-labor and for unions and working men and women. Your church, whatever it is, should be for these things. It should be made out of Jesus and the values in the Sermon on the Mount. If it is not, then renew your parish church, not the Democratic Party. God love and keep you and yours always. This nation is finally moving in the right direction! Thank you Lord. Michael Staley, let me first say that I’m a conservative who did not vote for Trump. Having said that I find your judgmental attitude toward people like Stephen who choose not to get on board the leftward leaning dump Trump bandwagon disturbing. True TEC should not be a country club, but it also shouldn’t be just another wing of the DNC. Who are you to accuse people like Stephen of being less of a Christian because he chooses not to be involved in these activities. That’s about as arrogant and un-Christian as it gets! As for doing holy work, many people have different definitions as to what holy work consists of. To you it means resisting Trump policies by any means necessary. If a Christian who is pro life chooses to picket a Planned Parenthood facility or an abortion clinic would you consider that holy work? Of course not. Instead you would probably condemn it. As a Christian you need to stop looking down on people who don’t agree with your views Michael. Our Lord and Savior doesn’t love you one iota more than He does people like Stephen. Let’s set the record straight: I didn’t say TEC should become another wing of the DNC, that Stephen has to make DAPL or Keystone XL (or the environment) as his own issues, or that Jesus loves me more than Stephen or anyone else because of the issues we take on individually or as a church. You said those things, not me. Further, I’m keenly aware that Christians embrace issues from different perspectives that often are in conflict. What I am saying is that the church has an obligation to be politically engaged. I don’t know what Stephen’s definition of “God’s work” is, but I do know that advocating for those whose rights are impinged upon, and for the right use of the environment is holy work. Yes, we must feed the hungry, but we also must work against a system that perpetuates hunger. I’m making an assumption here, and I hope not unfairly, but Stephen’s definition of God’s work seems to be focus on serving food and providing shelter, meanwhile staying out of politics. What I’m saying is that we must do both. You’re entitled to your political beliefs, but to cloak leftist activism as God’s “holy work” is rather presumptuous. I guess God speaks directly to you, and you have received a personal message that God doesn’t want an oil pipeline. The Comments to this article, as well as other articles on ENS, reflect the disharmony and divisions caused by the actions of the Episcopal Church and its intolerance for anything that is not in line with its leftist agenda. Rather than call to resist, riot and protest, the call should be for unity, reconciliation and dialogue that avoids name-calling and vitriolic personal attacks. As far as good works are concerned, Stephen’s acts in “serving food and providing shelter” to the poor, which you demean and denigrate, are far more constructive than all of your rants and “holy work” proclamations. Are conservative commentators here implying that the Keystone XL Pipeline, the Dakota Access Pipeline and indigenous rights are left-right issues? It seems to me that these matters should transcend partisan politics. Being a Republican doesn’t mean that you want to wreck nature or run roughshod over indigenous peoples. Michael, I appreciate your reply. We all have to follow our hearts regarding how best to serve the Lord. If for you that means getting involved politically , fine. All I ask is that you respect the people who take a more traditional approach. They are not hiding behind stained glass windows any more than you are. They have their own way of expressing their faith, just as you do. And I will leave it at that. Let me wish you in advance a happy Lent. I think we need to get some things straight about the Dakota Access Pipeline so we know what or if we even should protest. 1. The pipeline does NOT cross any land owned by Standing Rock Sioux. It is ALL on private or federal land. 4.Drinking water is NOT the problem. The drinking water intake was moved years ago 70 miles south of where the pipeline is going. 5. The pipeline is to be installed 100 feet BELOW the riverbed. 6. There are dozens of other pipelines of gas, oil, etc upstream already. 7. The oil is ALREADY being shipped by train or trucks which have more potential to spill than the pipeline. Thanks Arden for information we will never see on the mainstream media. Thanks Arden. As an Engineer, I see this happen all the time. To raise awareness, the opposition with the help of the press, develop a narrative that a group is being bullied/marginalizes and reinforcing this notion by challenging the do diligence of the design. The design effort could have followed all the laws and environment concerns and accomplished by faith based individuals but some how they are cursed and the good effort gets buried by the narrative. Basing “holy work” on someone’s narrative and not the facts or issues is troubling. We are all seekers of the God’s truth. Social justice issues seems to bring out division and either/or as opposite to both/and. Has anyone felt that inclusiveness is a buzz word that means think like me.